Mrs and Little Miss M spent the day fluffing hair and eating far too much at another Christmas party. Meanwhile, Al and I completed a fruitful ‘getting-very-close-to-Christmas’ expedition at the Chedi with their gourmet shwarmas around the pool. In the evening, we followed friends to an unexplored Indian restaurant near Wadi Aday. 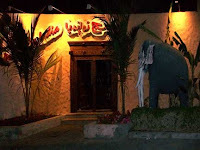 A life-size elephant guards the entrance to a courtyard in front of the Passage to India restaurant, wh ere we took our seats at a large copper-covered table. As we ordered our dishes, two musicians were already in full swing with drum, harmonium and vocals, making conversation practically impossible. During the meal, with the volume adjusted, an elegant young girl joined the band to perform with various props such as a succession of progressively smaller pots and a flaming vase. As if that was not hard enough, she also danced while balancing on a drinking tumbler and we noted a couple of swords were lined up to entertain the steadily increasing number of customers.